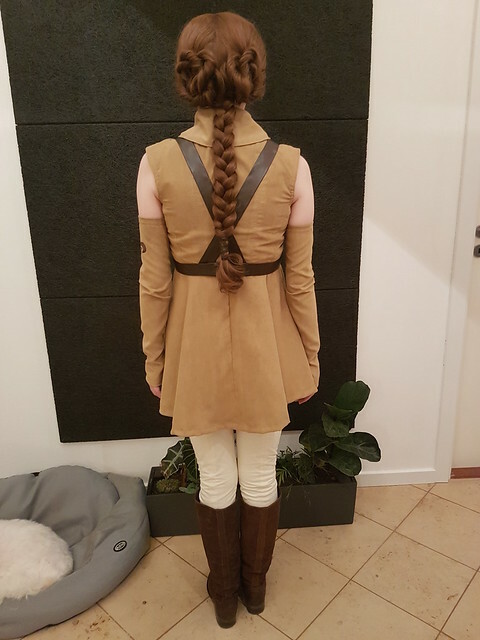 So, my sister (Lutetia) and I are making her a Mustafar outfit, which needs to be ready before May, since she is growing out of her other costumes. If possible we'd love to get it done before the first weekend in April. 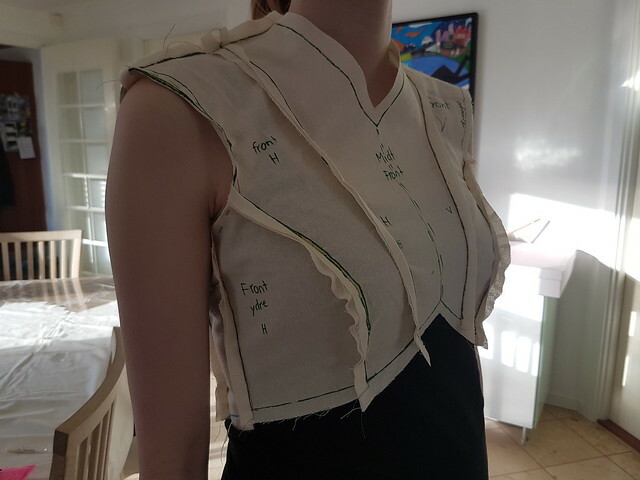 So, here are the first few pictures of our mock up of the bodice. Please share feedback, as we hope to get most of the work done this week and would love to fix any mistakes we may have missed. 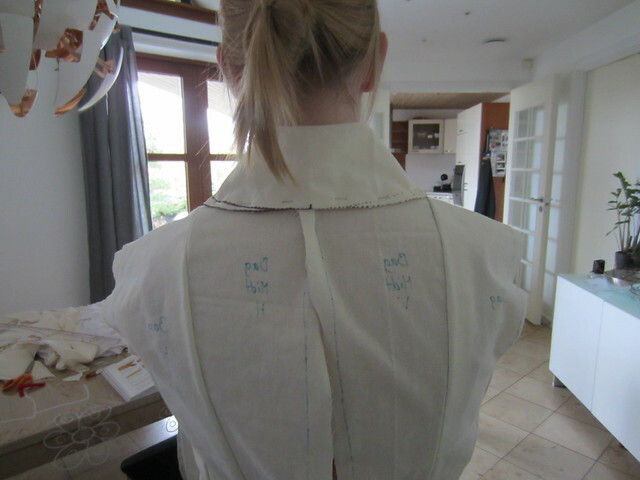 It should be noted we do all our corrections on the right side (left of picture) and then mirror them to the left side. 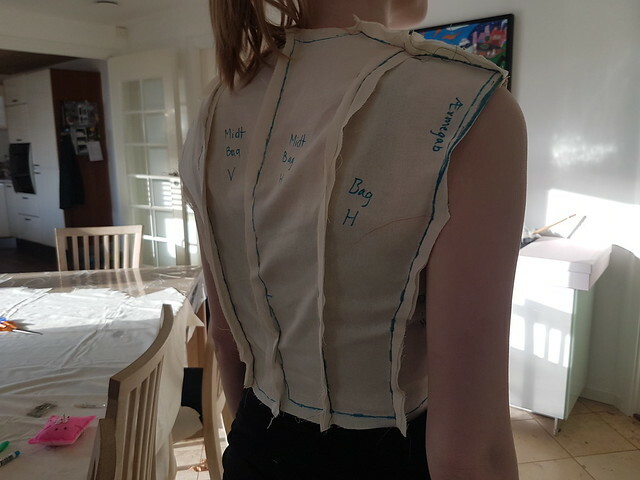 We have already added another centimeter to the edge of the shoulder as we both agreed it wasn't quite wide enough to go just over the edge of the shoulder. But now does it look? 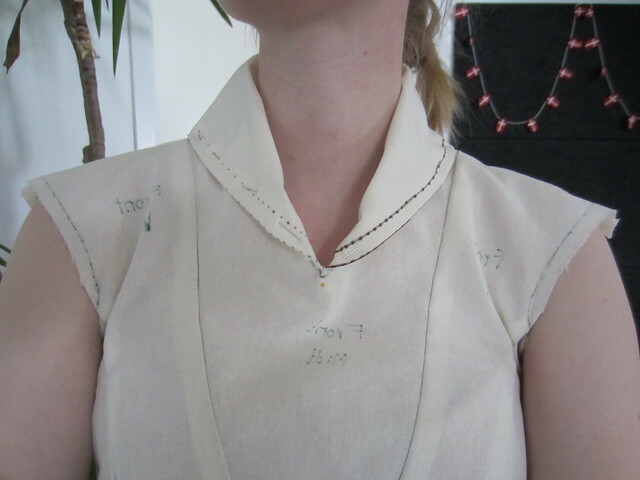 The neckline hasn't been worked on, but we will do so when we get to the collar. 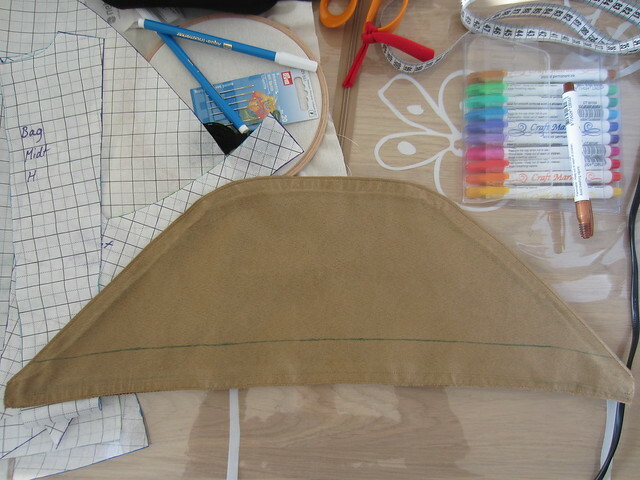 We'll probably do the skirt first. 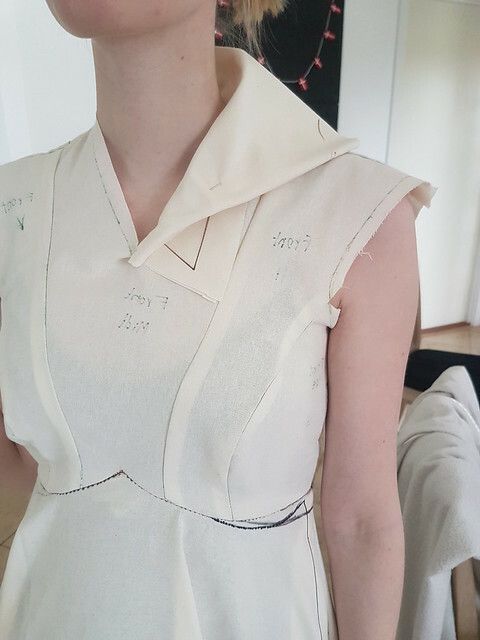 Other than the shoulder issue you mentioned, the lines and fit look really nice so far. So... 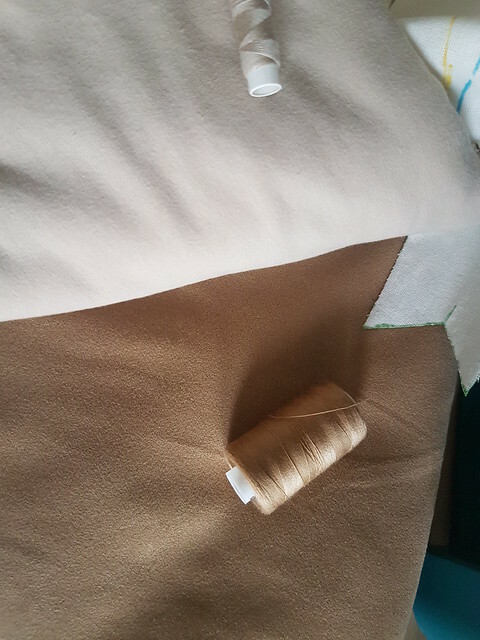 I've been busy with making costumes since Easter, so this didn't get updated. Had a deadline last friday, so now that is done with, the focus is back on this. We've got two weeks to finish, and hopefully most should be done this weekend. But first an update of what has happened since then. 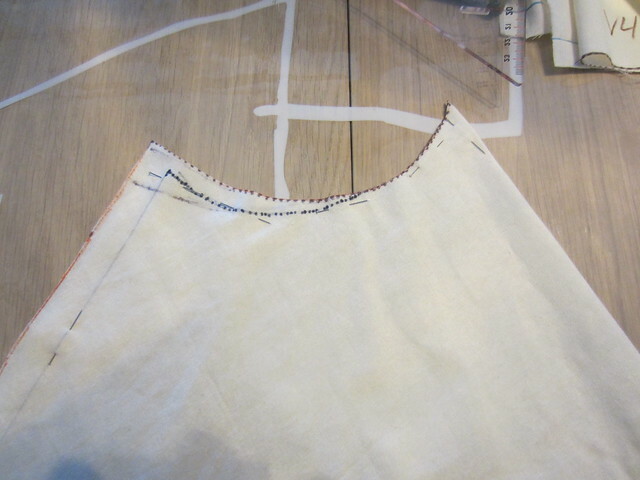 We started experimenting with the skirt. 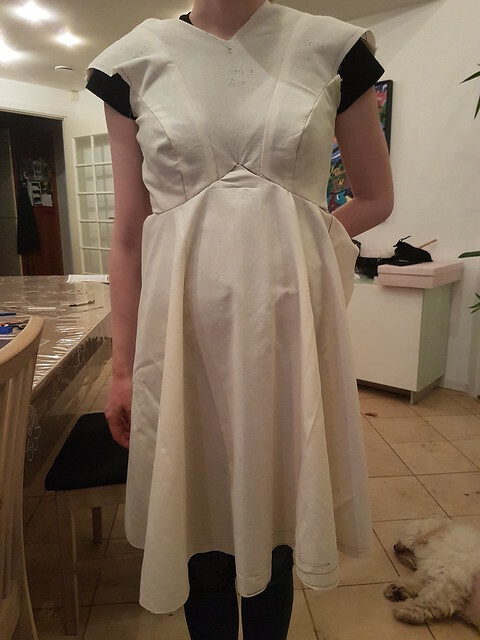 The first didn't put enough fabric in the inverted V and over the belly, but I found a form that would after a bit of fiddling around. 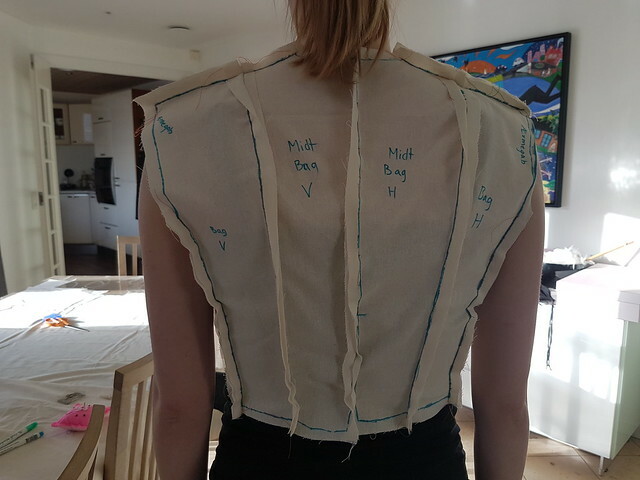 We started with one back skirt, but later split it according to the references. 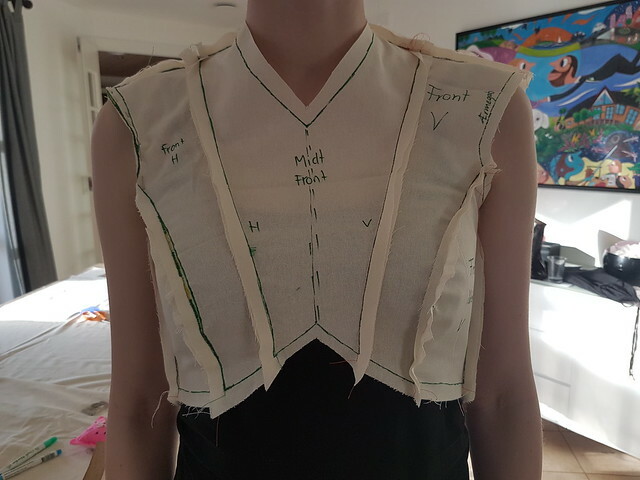 That also means we can use a longer invisible zipper and that will make getting into and out of this costume so much easier. 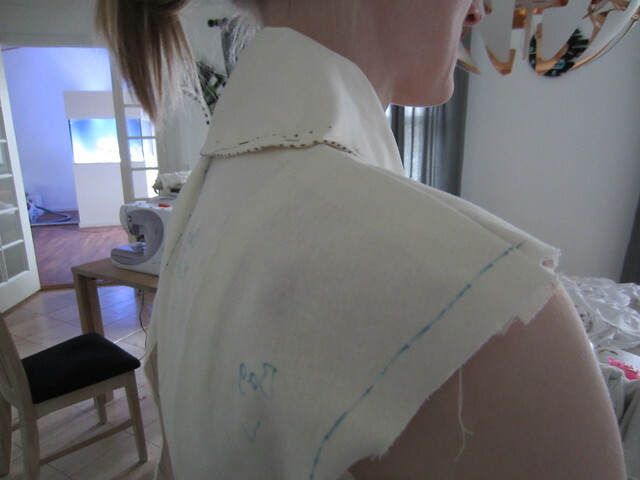 Collars... yeah, that was fun. Went through a few iterations to try out different shapes. 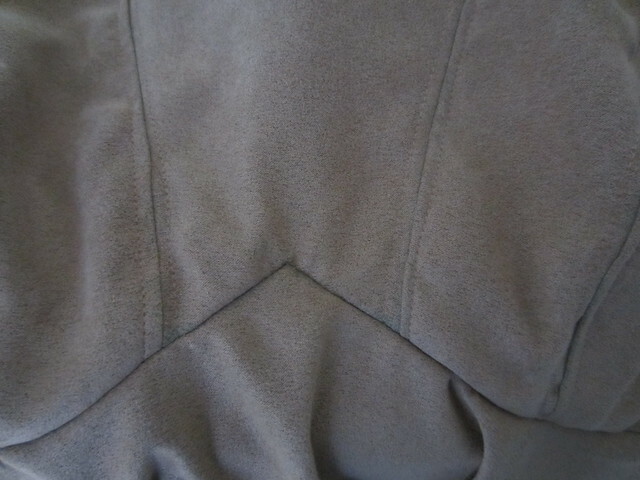 Looks nice and sharp, but too tight. 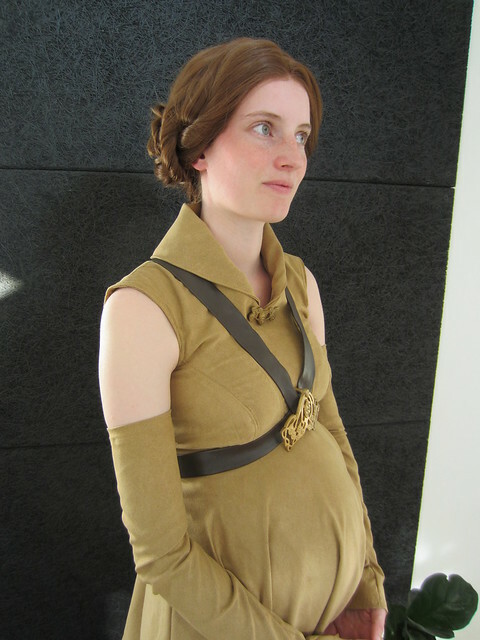 (Please ignore how the costume sits; it wasn't properly closed in back for these shots). 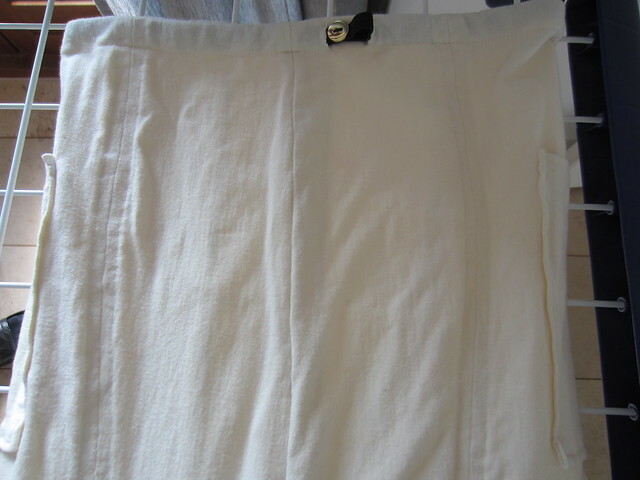 We shortened the skirts, but kept them intentionally too long. 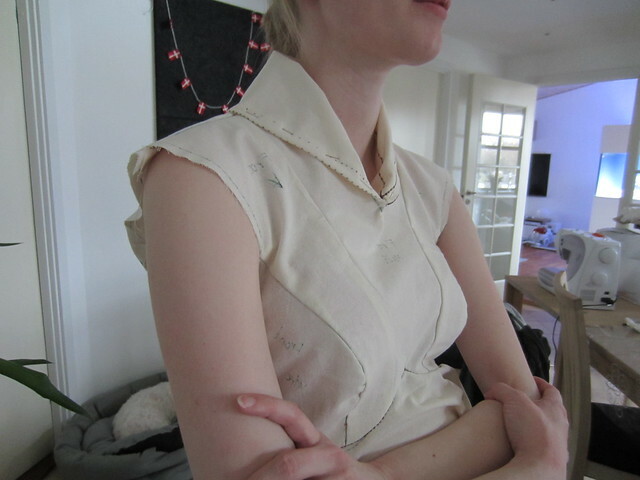 We will adjust to the right length once the actual dress/tunic is done. 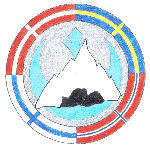 (Shorter in front than in back). 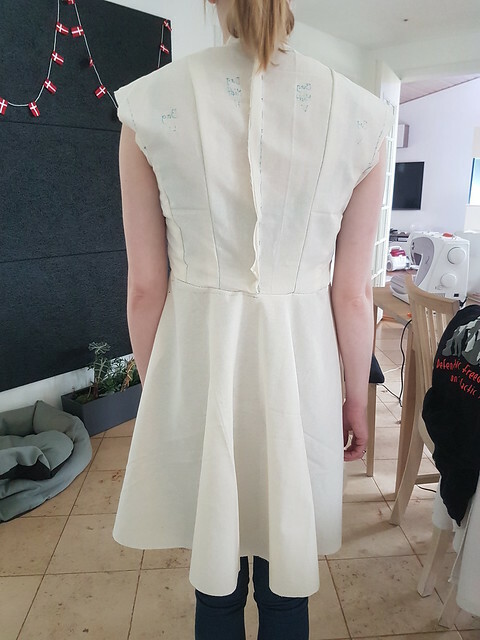 It should be noted the skirts totally are just over a half circle and I wouldn't recommend doing a skirt more voluminous than that. We've got plenty of volume with this. 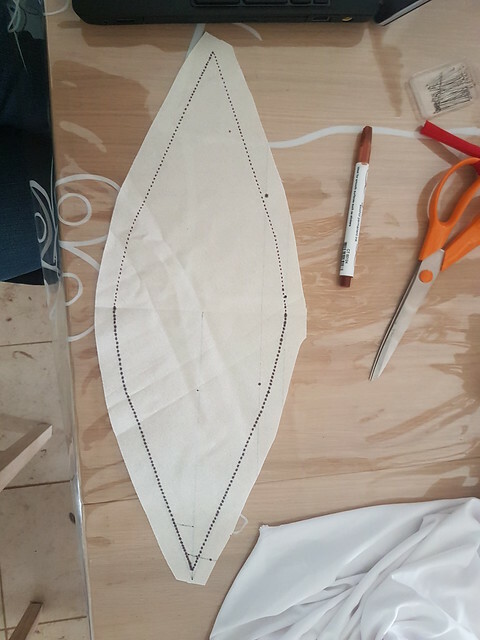 Also made a pants pattern by drawing on and cutting up some other pants. 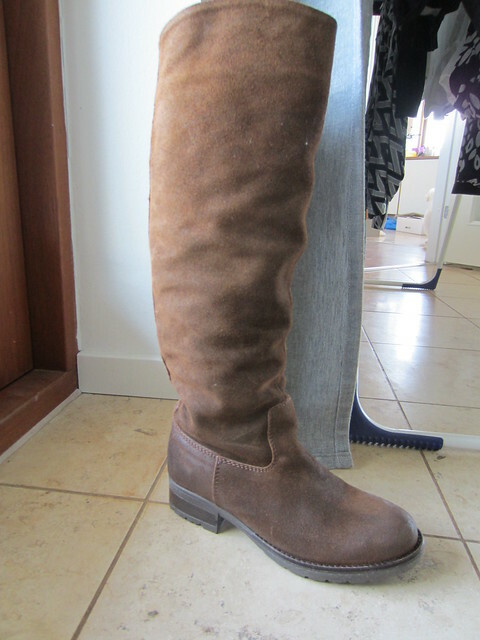 These are made from lycra. 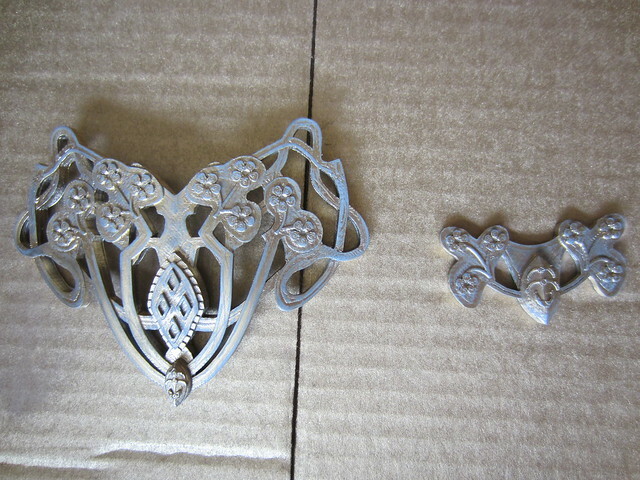 And of course, there's the brooches! We got the 3D print from Thingiverse. It's not a 100 percent accurate print, but it does capture the feel of the original and have the right size. I plan on doing some more rounds, but it is time consuming. The general guideline says nine rounds to really get rid of those printing lines, so hopefully I only got four more rounds of sanding and spraying to go. It is starting to look nice and smooth, but I have to say it is difficult to sand around all the little flowers and into the nooks. 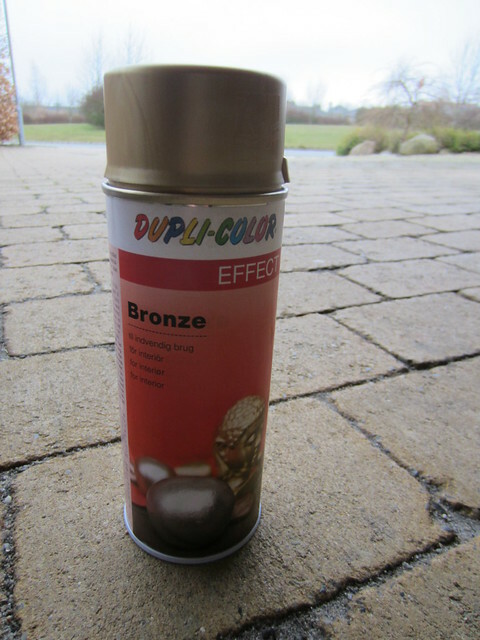 If you can get this cast in bronze it will be so much easier. I have bought some black wash that I plan to age and weather the brooches with, but I will test it on our test piece first. 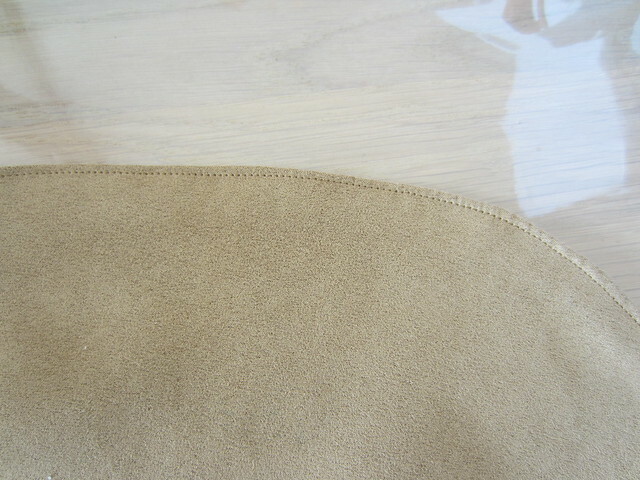 And finally, two different fabric options for pants. We are not thinking the lightest one will be a good choice. Well, that should be all for now. 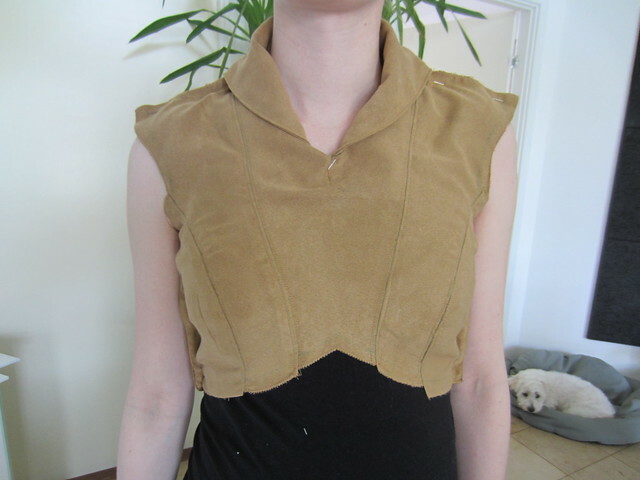 I have to buy sew in magnets tomorrow for attaching the collar, and then we need to get cranking. 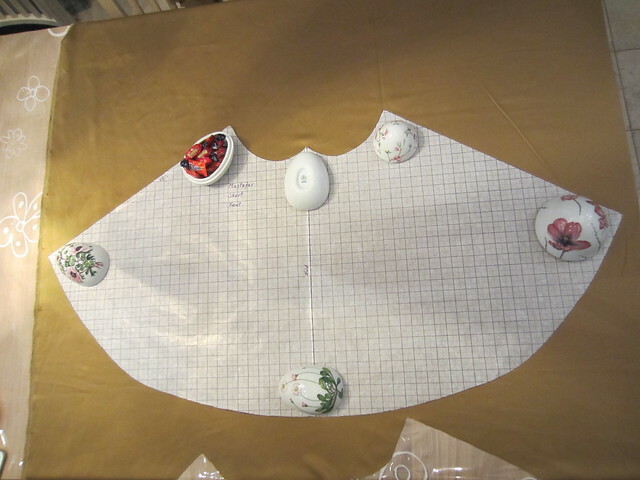 We still have to make a sleeve/gauntlet pattern, and I have to transfer the skirt patterns to pattern paper. Well, we did get a lot done during the weekend. I didn't expect us to get done, but we got a good way towards it. 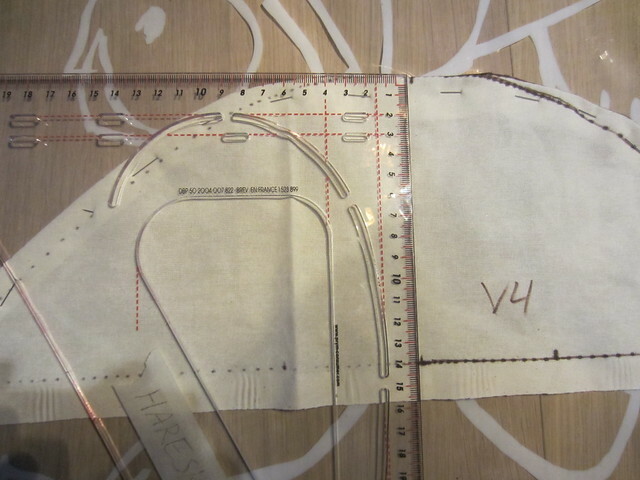 First: here is the full front skirt pattern, about to be transferred to the fabric. 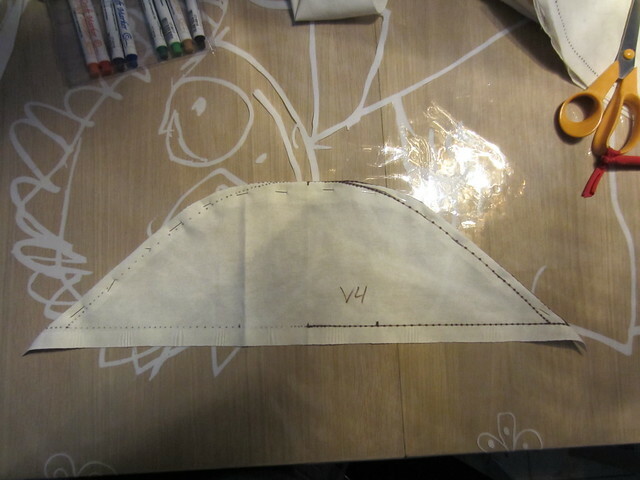 Pants are done, and have the top stitching on both sides of the front and back seams. 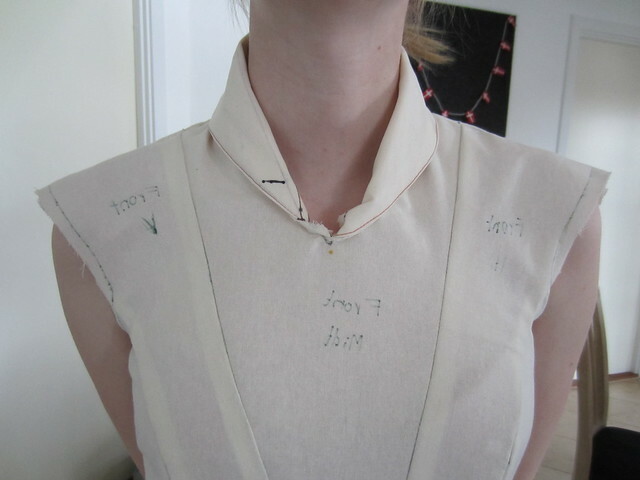 This was my solution for hiding the sew on magnets; adding a second layer along the edge of the collar. We will not be fully lining this, because we both hate to line things and we have a deadline. 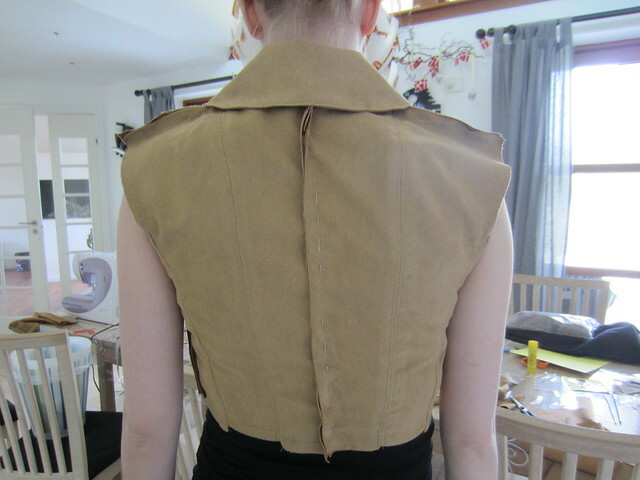 It took a while, but all the metal plates are sewn on the center front and back pieces. 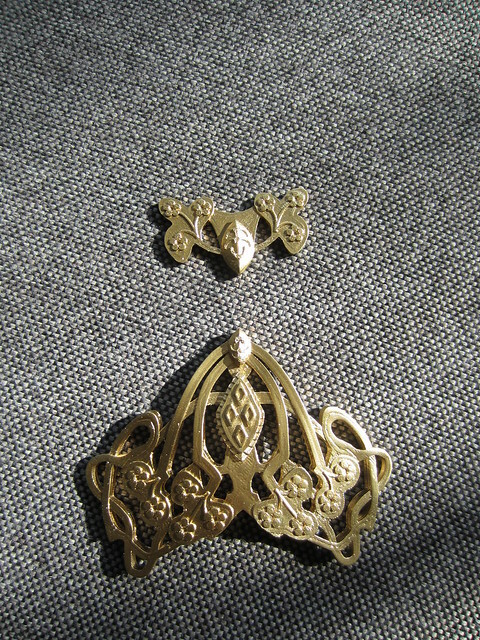 The magnets themselves will go on the collar piece. 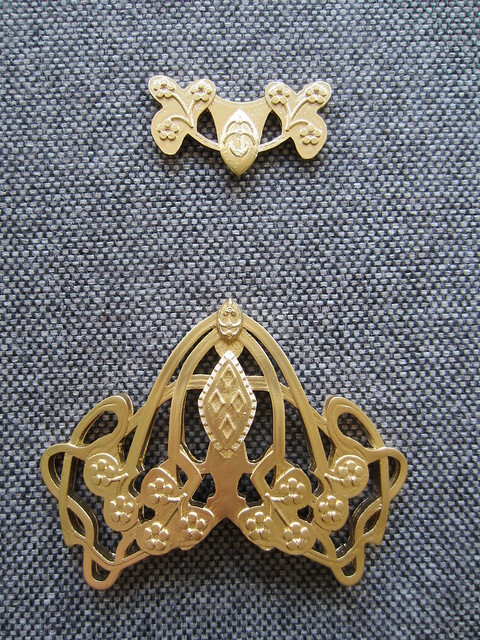 The small brooch will also have magnets clued on and attach to these. 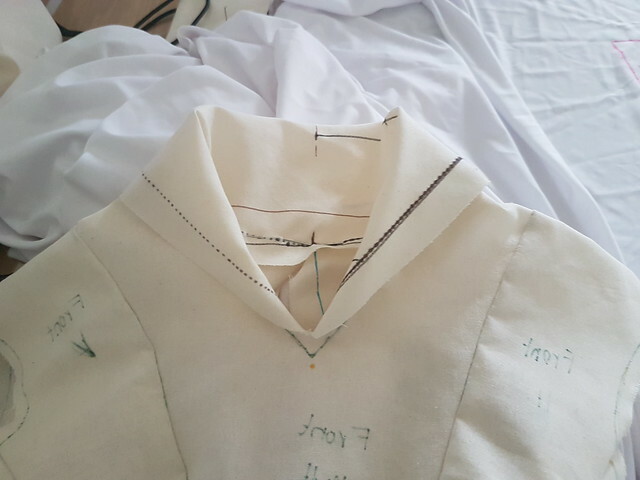 I also got the collar sewn up, including the top stitching along the edge. 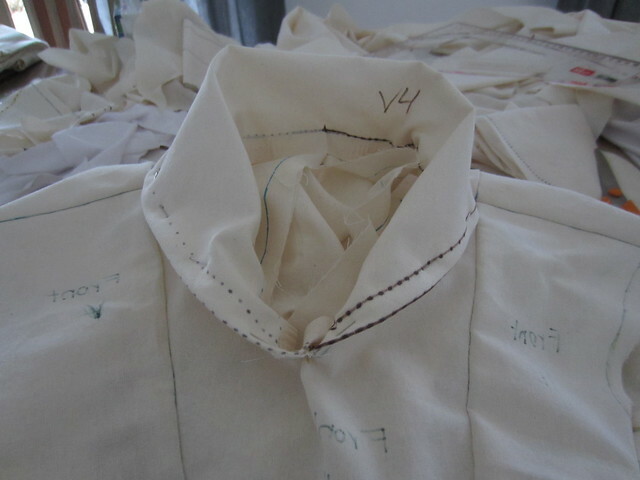 The most annoying seams (the seams over the breasts) are also done and top stitched. 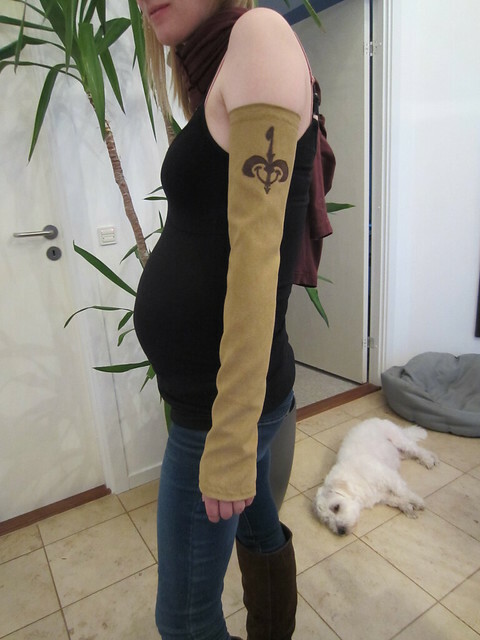 And we got work started on the sleeves/gauntlets. 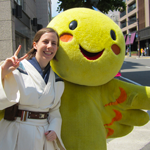 The Naboo symbol will need a little more work, but this is the general size. 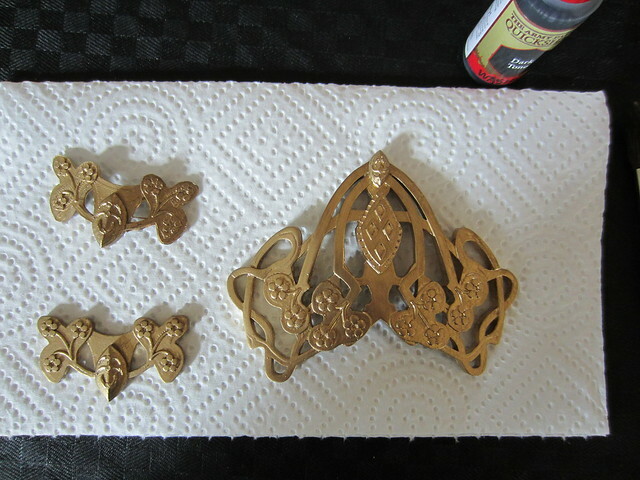 And for those curious the brooches are on seventh sanding/painting round. I'm officially tired of sanding. But most print lines are either gone or not very visible now. If anyone want to share how they did their hair/wig, then please do so. Great job so far ! 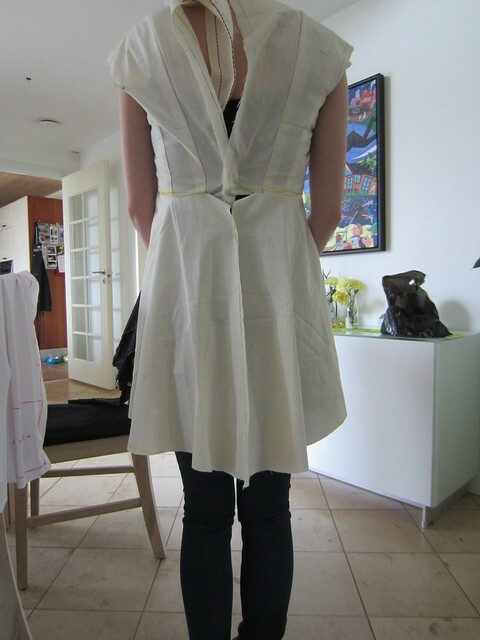 Well done, my opinion I would make the collar slightly bigger, especially on the back. That's all, everything seems fine so far. This actually got finished and approved, but I have been doing other things, so didn't get the thread updated. 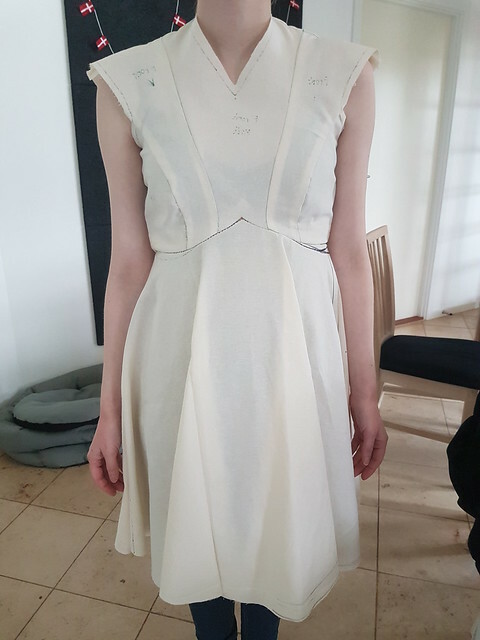 After an couple of very intense days where I got really tired of sewing and hemming, we finally got it done! Or course, we have a list of wanted upgrades (we are perfectionists), but we are quite happy with how it turned out. 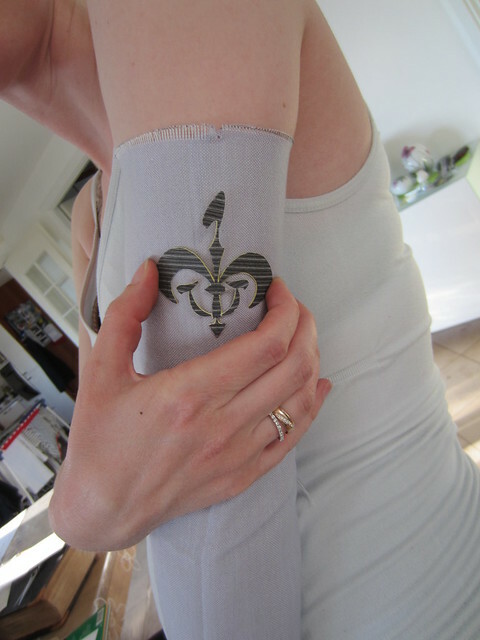 This has been painted, but an embroidered version is a future upgrade. 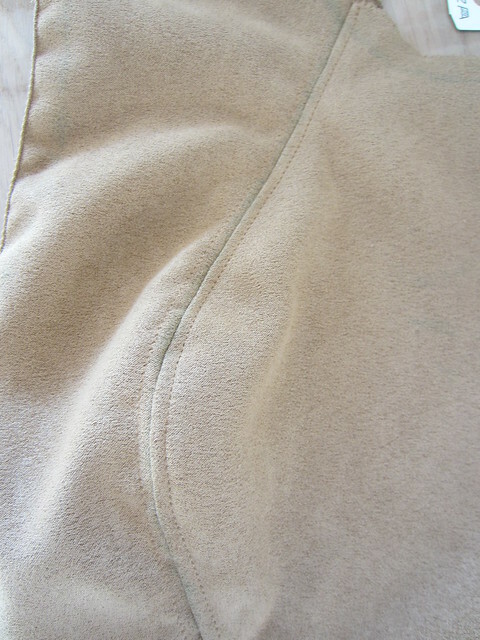 Really, annoying, inverted V. I hand stitched the top of it, because that was the only way to get it nice. 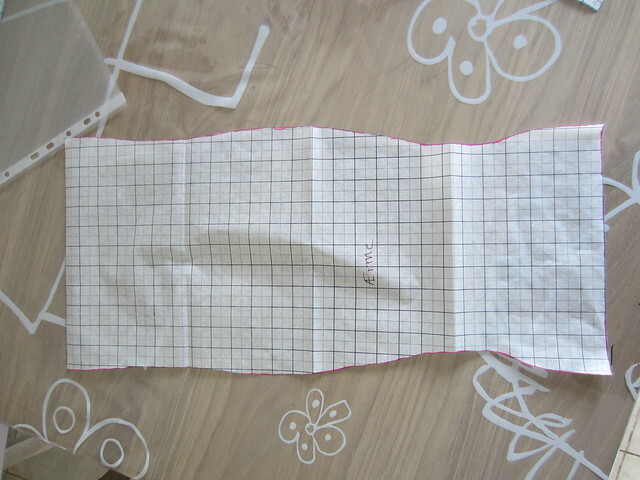 Pattern for the sleeve. 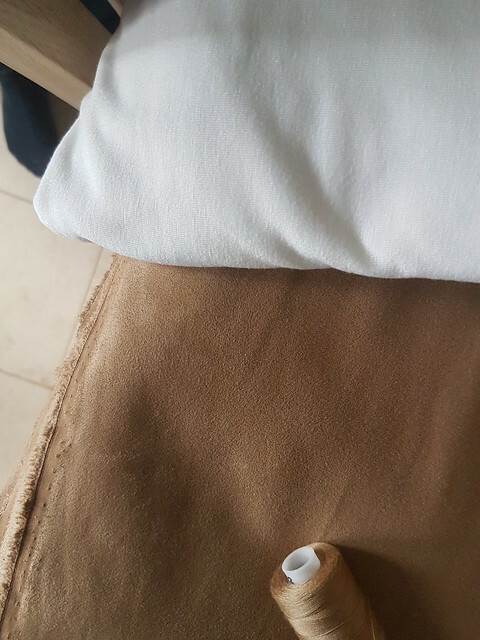 It starts tight around the upper arm, then widens around the elbow, tightens again towards wrist, then widens around the hand. 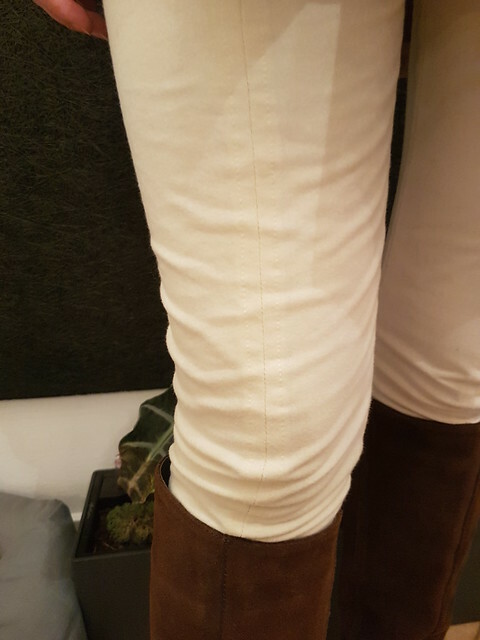 Pants with pockets! 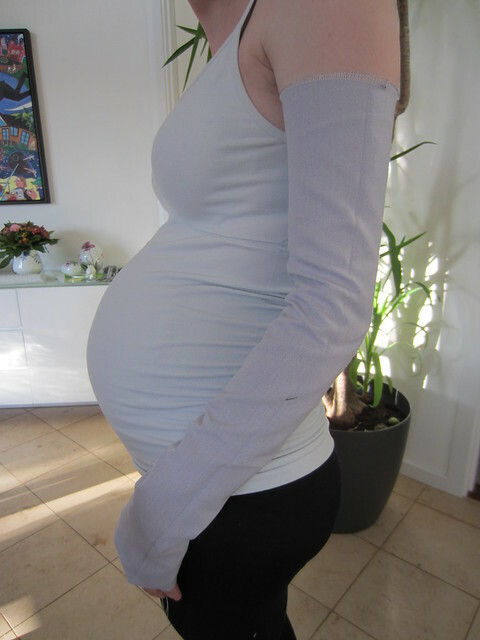 And an elastic to adjust the tightness above the stomach. 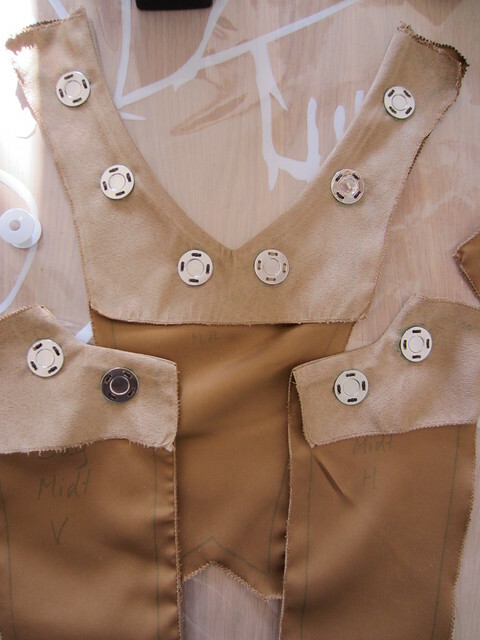 The pockets can hold a cellphone and a credit card, and because of their placement it cannot be seen at all when in costume. The wig has been restyled, um, three times since then to something we like much better. 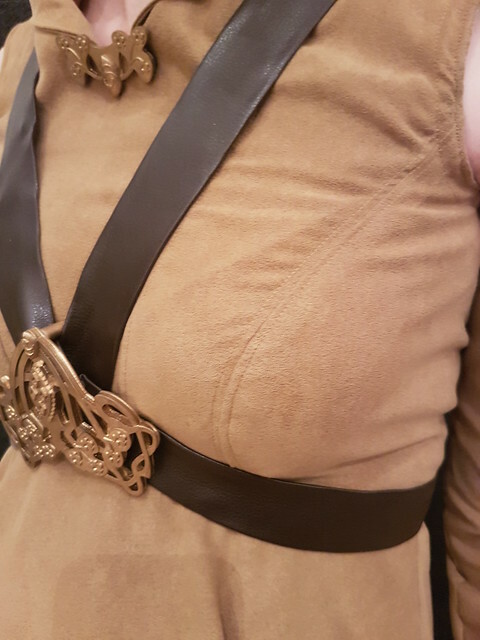 Like I said we are happy with the result, but the harness will be upgraded, and so will the collar, I think. 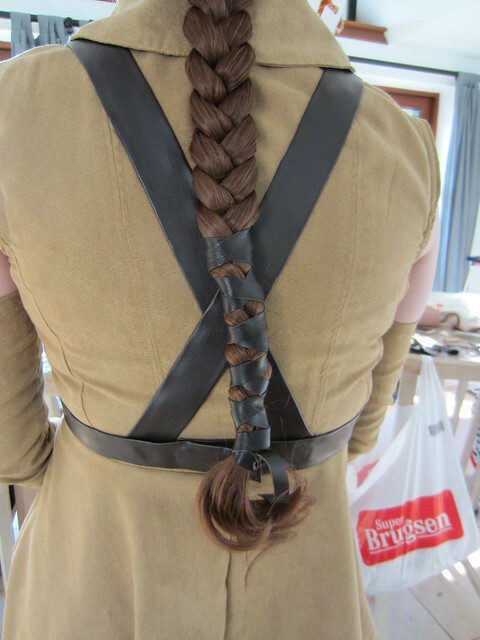 The braid pushes down on it, so some good interfacing would be helpful in keeping it standing properly. 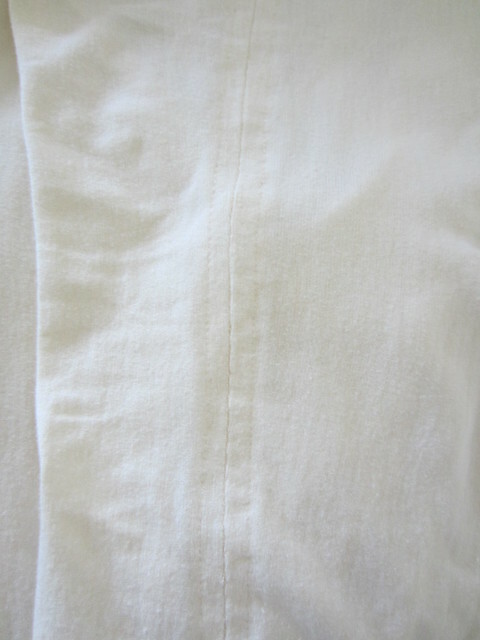 We both recommend the hidden pockets on the side of the stomach for any costumer, who likes to have pockets and being able to carry their phone with them.